Many years ago I began a new family tradition of the Christmas Tablecloth. I bought a new white tablecloth and a set of colored pencils. 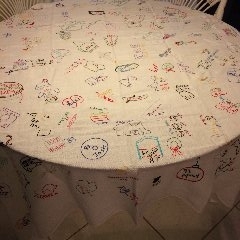 When dinner was over, I cleared the table down to the bare tablecloth and invited everyone to draw some small graphic of something that was important in their life that year and include their name and the year. When the holiday was over, I set down to embroider all the little images, then I washed the tablecloth and folded it away with my holiday things. Each year that tablecloth came out to grace our table and acquire new additions. It just so happened that was my husband’s last year with us, although we didn’t know it at the time so we treasure that one especially. Now, all these years later it’s fun to check out all the images from years gone by, friends that happened to stop by, relatives no longer with us, new sweethearts, then wives and husbands and now grandchildren. It’s fun to remember the events the drawings bring to life. And it’s especially nice to realize how blessed we are with family, friends, love and laughter and memories to last a lifetime. As my children have married and now take turns hosting Christmas each of them have begun a tablecloth of their own, including my daughter-in-law. So no matter where we spend Christmas, we get to reminisce and add new memories for the future. 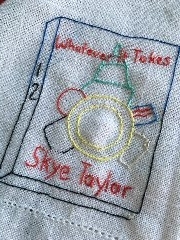 A few years ago, my contribution was to commemorate my first published novel, Whatever It Takes. Now I have three more, the Tide’s Way contemporary Romance series. Falling for Zoe, Loving Meg and Trusting Will are all available in print and eBook. In addition, two short stories connected to the series are available for free on Kindle: Loving Ben and Mike’s Wager. You can also visit this blog later in the month to read an additional short story which will posted on the 29th. Leave a comment and have a chance to win an eBook copy of one of the Tide’s Way books (Kindle, Nook, iBook, or Kobo) I will be giving away one copy of each book. Or you can opt for my main stream Whatever It Takes if you prefer intrigue and action over romance. Cover summary and buy links for all of my books are available on the MY BOOKS page of this website. 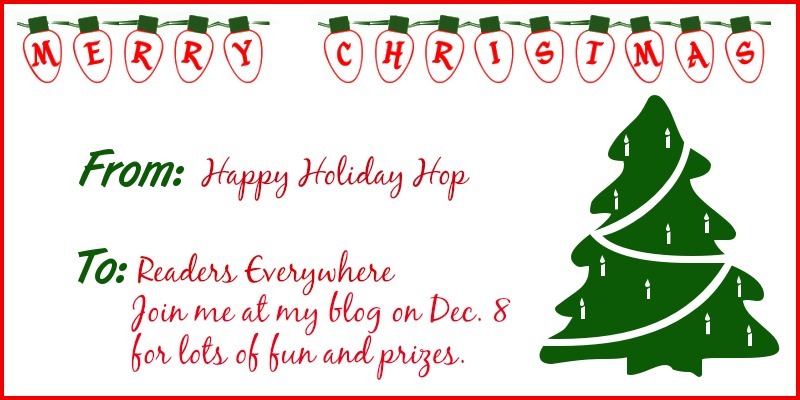 Visit the rest of the blog hop for more holiday stories and more chances to win prizes. What a beautiful Christmas tradition! It's a priceless family treasure. Have a wondrous holiday! 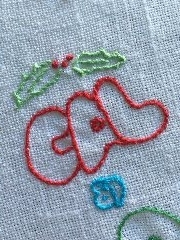 I love the idea where you had people draw or write and then you embroidered the spots. That is really neat. Love the tablecloth idea - so neat! I live in NC, so the beach setting in some of the books sounds good to me. What a cool idea! We did this one year for New Year's Day with permanent markers. I love that you embroidered all the images. What a treasure. This is such a wonderful idea. I'm sharing it with my daughter in law. She loves to do needlework. What a lovely tradition, Skye! And how special to have your husband's name there. 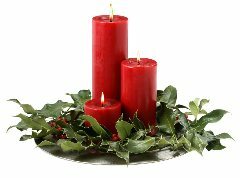 Blessings to you and yours this Christmas.